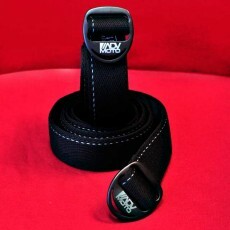 Perfect for stashing cash and other valuables, this high quality top-stitch belt has a 24"+ secret zippered pouch and features the ADVMoto logo on the buckle. Although the webbing is synthetic, it feels more like a cotton webbing and won't dig into your waist or hips when bending or sitting and will not stretch. Belt width is approx. 1.5" (38mm). Length measures 48" from belt tip to buckle attachment and can be trimmed with a hot-knife.